OPPA32 is particularly well suited for ultrasonic measurements as well as other kinds of measurements which need many channels. 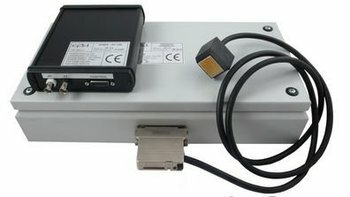 Together with the card OPCARD 2.0 or OPBOX 2.0 and ultrasonic probes it could be used as complete ultrasonic testing device. Each channel has separate pulser and receiver. Specific equipment predisposes it to work in phased array mode. becomes complete ultrasonic testing device. Multiplexer operates with 32 ultrasonic transducers, and thus has 32 independent transmitting and receiving channel. Each channel is equipped with individual delay lines, which can be programmed so that the pulse transmitter on the channel is being shifted in time relative to other channels.